blog.HalloweenAdventure.com | Latest News from the Costumes Trend FrontLines! : Wear your Politics! This Halloween, wear your political statement: on your face! We have a variety of masks that’ll help you portray the candidate you intend to vote for, or perhaps, to mimic the candidate you don’t like. Either way, so long as you ensure that you’re not malicious or offensive to those around you, imitating popular politicians is a great Halloween idea! Start with our Barack Obama Adult Mask. Is this the face of our next president? He's the new kid on the block with "rock star" appeal and one of the most fun names in politics! Bahama Mama? NO! It's Barack Obama! This realistic over-the-head mask is made of soft vinyl and showcases the democratic hopeful's facial features and signature hairstyle. 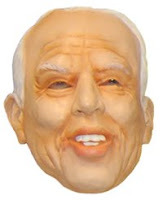 If old world (ok, just plan old) is more your style, try our John McCain mask. Are you a true blue Republican? Then show your support for this Presidential candidate. John McCain is the Republican Senator from Arizona who wants to change his residence from the Grand Canyon State to 1600 Pennsylvania Avenue. This realistic over-the-head mask is made of soft vinyl and showcases the republican hopeful's facial features and signature hairstyle. Maybe you can’t let go of the past. You were a Clinton supporter then, and you’re still one now. You just pretend he’s still president. Well, what better way to show your love for Bill than with our Bill Clinton Mask? Perhaps you can weasel your way back into the White House with this one. It is quite realistic! Go way back to the beloved JFK days with our John F Kennedy mask. Loved by many, a man that left us too young deserves to be remembered. While it’s great to commemorate a great president on any day, wear yours this Halloween, because it’s a day so close to this year’s elections! Use it to spark political debate. Talk isn’t action, but it’s a good starting point! Where all my independent women at? Girls, step it up this Halloween. Instead of going skanky, go political! 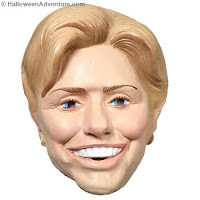 Try our Hillary Rodham Clinton mask. She may have lost the democratic vote for Presidential hopeful, but she’s still at the top of many women’s lists. She’s smart, hardworking, and she knows her stuff! GO HIL!